Contracts Cancelled | Mothers Against Wind Turbines Inc.
My name is Ruby Mekker. I am not one of your constituents but today I read a letter written by one of your constituents, Barb Ashbee in 2009. It is attached and I encourage you to read it. The very sad outcome is that nothing has changed since 2009. Sylvia, the PC Party of Ontario repealed the Green Energy Act Dec 3, 2018 and the same day introduced ERO 013-4265 (as well as two others). This proposed regulation will grandfather ALL “in-process” and “existing” wind projects under the old Green Energy Act. This is NOT what the PC Party promised the people of Ontario. What is described in Barb’s letter is still occurring in YOUR riding; nothing has been done to help these people. Approving ERO 013-4265 will condemn these people to the “hell” they have been living as described in 2009. When did democracy die in Ontario? We believed the new majority PC Party would keep their promises still posted on their web site. 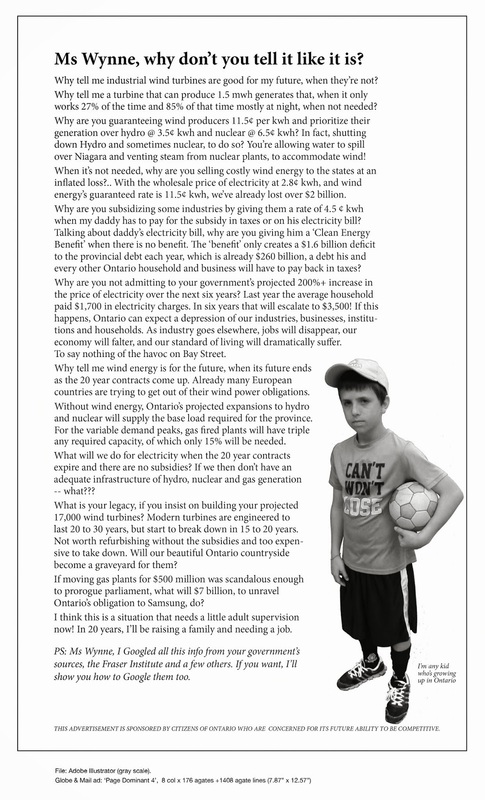 To date any actions of the PC Party towards people living with industrial wind turbines have been nonexistent. Yes, we acknowledge the PC party did cancel many “green” projects but chose not to cancel the pre construction Nation Rise Wind project in North Stormont (only 1 of 2 LRPI projects not cancelled even though this project had its key milestones approved by IESO hours before the writ was dropped). Presently, we the constituents are demonstrating to Ministers Rickford and Phillips how and why this project must be cancelled. If allowed to proceed the majority PC Government of Ontario will have allowed another part of Ontario to be put in jeopardy; Nation Rise Wind project is located on recognized highly vulnerable aquifers, the West Quebec Seismic Fault, vibration sensitive Leda clay; all of which the proponent did not report to the Ministry of Environment. Need I go on…. Sylvia it is time that like Tod Smith, you, Lisa Thompson, Monte, Bill Walker, Sam Oosterhoff, Rick Nicholls, Randy Hilliard, Toby Barrett do what you asked the Liberals to do in Lisa’s 2012 Private Member’s Bil, in Sam Oosterhoff’s 2017 Private Member’s Bill AND in the 2018 campaign; stand up for YOUR constituents; do your fiduciary duty; DO NOT allow ERO 013-4265, address the issues. As Monte so eloquently said in 2012,”I believe in democracy. I believe in giving a voice to rural Ontario.” Monte, too, has let his constituents down. No one asked for this. Nobody looked to have their life and homes exposed in the news, trying to explain how the most promising form of renewable energy was causing such destruction of their family. Sleep deprivation, headaches, migraines, heart palpitations, tinnitus, pressure in the ears, sores that won’t heal, dangerously high blood pressure and the list goes on. This was not the plan that any of these quiet and unassuming rural families had in mind, but this is what they got. And countless months later it continues. Nobody wanted to get sick; nobody wanted to be forced to leave their home, the place they raised their children, the place they intended to live out their retirement. Not one of them asked for this. In almost all cases, these symptoms were non-existent before the start up of the wind farm. And when it was discovered these wonderful, planet saving industrial machines were actually hurting them and their family, not one of them would anticipate there would be no help for them. As they read in the papers how our government was running to help other citizens who found themselves in all manner of troubling circumstances through no fault of their own, there they sat, waiting, ignored and ridiculed for admitting they needed help against the giant industry that the government had hyper-promoted in their ambitious scheme to ’save the planet’. Who are these people, the green supporters cry out? NIMBY’S! They’re trying to stop our efforts to help the world! NIMBY’S! They don’t like change! They don’t want them in their backyard! Sorry, but nothing could be further from the truth. As a matter of fact, the vast majority welcomed wind farms as much as anyone. Some even boasted how proud they would be to participate at such close hand, to be able to help make a difference, to assist in providing clean, renewable energy. But when the troubles started, the government looked the other way. When the troubles started, the government ran the other way, fingers in ears, la la la. There was no time for anyone or anything to stop this magnificent much needed multi-million, make that billion, dollar program and so they chose to ignore and abandon those who asked for help. They simply did not respond. As a matter of fact, some of the residents were subjected to blatant derision from their MPP. The people asked their local town council for help. They asked the Ministry of the Environment for help. They asked the Public Health Unit for help. They asked the Ministry of Energy and Infrastructure for help. They even asked the Premier of Ontario directly for help. Nothing happened. No one responded. No sir, what they got from the Premier of Ontario was a loud and strong message that he was not going to let any NIMBY’s slow down his cause. Thrown into the already brewing mess was the Green Energy Act. Sounding like a wonderful piece of legislation that would help this province and in turn, the country achieve the desired energy saving goals, it turned out to be a complete removal of rights for Ontarians; the complete dismantling of democracy in one piece of legislation. What most people didn’t know or pay attention to, was what the Premier and his two Ministers were trying to push through at lightning speed would affect everyone, not just the rural residents. And oh, how it does! And so the letters flowed and the meetings started; ministry workshop meetings, presentations at the legislature’s standing committee hearings, public input at the local government held meetings, written submissions to the Green Energy Act Registry. Thousands of letters, documents and studies by a bevy of very astute and credible professional engineers, doctors, health professionals, lawyers, electrical engineers, professors, all manner of Ontarians with and without degrees, from all walks of life and, of course, the residents who were already being affected, already sick and getting sicker by the terribly close proximity of the wind turbines and electrical groundwork. All of these people at a grassroots level, taking no money for their time or for their obvious expense of preparing and printing papers and running around the province to government meetings and rural town hall meetings. All of these people doing the research that the government should have done before they started down this road, showing what a miserable failure simple lack of planning creates. All of these people trying to inform the government of the very serious issues with the wind farms. Yet in the space of maybe 45 days or so, since the last submission date to the Green Energy Act Registry, designed for public input and reaping some 1300 submissions alone, this government said they had seen enough. They’d had enough time to look through all of the information submitted; the very complex engineering reports, noise studies, the reams of information on health effects, turbine failure, viability of wind as an energy source and the safe requirements for setbacks that would keep all citizens out of harms way. They repeatedly refused all requests by health professionals requesting the government slow down and conduct a proper independent health study to determine the health effects. They had also heard the victim statements, pleading with the government for help, to please listen to them, warning them to not put anymore people in the position that they found themselves in, through no fault of their own. It all fell on deaf ears. There was no way that these Ministers were going to slow down. No matter how many people tried to warn them, they were not going to let anyone stop them in their plan to spread their wind turbines far and wide across every rural inch of the province and ringing the Great Lakes shorelines. No sir, they were going full speed ahead. They took away the rights of all citizens of Ontario. All citizens, not just some. They overruled the professional planners who understand and know the ramifications of setbacks and public space planning so that they have no say in the municipality anymore. They overruled the town councils and Mayors who have no say in their own backyards anymore, the place they know much more intimately than any Minister, or developer. They overruled everyone and everything. No one has ever seen the likes or speed of a piece of legislation like this before. They ignore all of the facts brought before them, ignore and abandon the over 100 known victims, some of whom spend their days in restaurants trying to escape the conditions, who sleep in their cars with winter coming, who are billeted in a single room in a motel with children and more on the way, paid for by the wind developer. People with children, the children not knowing or caring about politics or landscape sightlines, but who bang on their ears with their fists asking Mommy to stop the noise, and young children who now complain of headaches. People with a new need for prescription sleeping pills and people who have lost everything. They’ve lost their livestock, their horses, their income, their way of life and the right to live in their own house. Children have had to move away. They live with relatives; they live by the goodness and grace of understanding strangers who offer them a place to stay. But in even larger numbers than these, are the ones trying desperately to stay in their own home, where everything they have is in and around them. Over 100 and growing. And so, at the end of the day what does the government do? They announce the same inadequate setbacks that they had previously spouted way back at the beginning of the year. Nothing had changed. It appears their minds were made up a long time ago. What a waste of taxpayers money. The whole industry is contaminated with non-disclosure contracts right from the start. When the landowners agree to host, after being assured of all the good things they are doing, they sign contracts. These are variously worded contracts that do not allow them to speak out about anything negative to do with the wind turbines and will entitle the developer to make any amount of noise, vibration or do what they need to on their land and the landowner may not complain. Some are embarrassed at being taken in by the salesmen. They had no idea it would be such an intrusion, but the money sounded sweet. I wonder how many other businesses there are that match the need for non-disclosure clauses being made with ordinary, everday citizens while receiving full government support. Why such secrecy if this is such a noble exercise? Many landowners with multiple turbines don’t live on their property. These are some of the ones who will say there are no problems and argue strongly to push ahead. Some have rented out their farmhouses cheap. The renters sleep with oscillating fans going all night long by their heads to try to cut out the thumping sound of the wind turbines clearly heard in their bedrooms. Many wear earplugs but they don’t always work. People ask, why aren’t more people speaking up, why don’t we hear more? Would you speak up knowing that if and when you needed to get out you wouldn’t be able to sell your house? Who would buy it? It’s not an easy position for any of them to be put in, nor do they want to jeopardize the hopes that the developer will help them, or the possible lashback by fervent green supporters in their community who are so careless with their words and judgment. Many are under contract and cannot speak. Some don’t have the courage or the life skills to know who to even contact. This is all new to them; it’s all new to everyone, even our leaders. So what about Europe people ask? Aren’t they all happy with their wind farms over there? No, they’re not. In fact there are over 360 grass roots coalitions in 19 European countries in exactly the same position as our residents, pleading to be listened to. They are trying to work with their governments on greater setbacks to protect the residents. As industrial wind turbines get bigger and bigger (40 storeys), some countries leaders have listened and have changed their setbacks to 1.5 kms and further. They acknowledge the problems,and they obviously care about the consequences. These symptoms and problems are mirrored all over the world. Next door in the U.S, Australia, Japan…..
No one can believe our government would completely ignore residents like this, especially the residents themselves. Surely there must be something wrong with these people if the government isn’t listening or taking action. Nope, in fact there is nothing wrong with these residents. These are all good people; honest people, the backbone of this country. Something wrong you ask? Perhaps you should be looking to the provincial government and their brazen, no questions asked backing and protection of the wind industry. On the eve of COP 24 in Katowice, the 2040 Polish Energy Policy Polityki energetycznej Polski (PEP) was unveiled and will remain in public consultation until 15 January 2019. While Poland has the privilege of having virtually all of its energy resources on its own soil, it plans an ambitious program to drastically reduce the share of coal to 60% of the electricity mix in 2030 and 30 % by 2040, instead of 80% currently. The project plans to increase electricity consumption from 165 TWh in 2018 to 232 TWh in 2040. His presentation highlights the competitive nature of nuclear energy, whose competitiveness must be materialized by the commissioning of 6 additional nuclear power plants starting in 2033 with a new plant every 2 years . In a forum , Energy Minister Krzysztof Tchorzzwski had mentioned the opportunity for the country, which already has 300 entities in this field, to develop highly qualified jobs. This energy programming focuses on gas transiently, as well as on renewable energies such as geothermal energy and especially offshore wind and solar energy. The big surprise is the decision to remove the onshore wind turbines from the Polish landscape by 2040 . The graph below shows the program of evolution of their installed capacity, starting with a slight increase intended to support the role of the gas before the commissioning of the first nuclear power station. Then their rapid suppression until their near disappearance as early as 2040. Energy Minister Krzysztof Tchórzewski justified this choice with strong opposition from the Polish population . This opinion mentions in particular the need for a precautionary distance between “1.5-3.0 km, based on the sound level, taking into account the modulation, the low frequencies and the infrasound levels” . At the time of its publication, the opinion referred to the study of 487 scientific publications on the subject, by a link, broken since: http://www.pzh.gov.pl/wp-content/uploads/2016/03 /Stanowisko-NIZP-PZH-Farmy-wiatrowe-Bibliografia.pdf an extract of the first and last page are reproduced below. Polish scientists are also not left out on this subject, particularly through studies on the physiological effects of exposure to wind turbines on goose farms and another on pigs , depending on the distance between them. machines and their place of breeding. In the same year, Poland passed a law prohibiting the construction of wind turbines at a distance of less than 10 times the height of machinery . Of flexibility to this law had been made this fall at the approach of the COP24. But the Polish energy policy by 2040 therefore plans to be more protective. At the opening of COP 24, its president, Michal Kurtyka, imposed a social justice component calling on all participants to sign the ” Silesia Declaration for a Just and Inclusive Transition “, in order to avoid this transition. ecological can be the place of business for some and the burden for others. By proposing the end of onshore wind turbines, this draft program also recalls that no economic or political objective should prevail over the well-being and health of individuals.